Travelling is becoming an important part of personal and professional life. Increasing financial risk during trip along with medical emergencies and other financial losses are increasing the need for travel insurance. Travel insurance is insurance covers trip cancellation/interruption, medical treatment, lost luggage, flight accident and other losses which incurred during international or domestic trips. Considerable growth in the adoption of travel insurance is now being observed by older population. In 2016, according to Travel Insurance Market Survey, the U.S. citizens spent nearly USD 2.4 billion on all types of travel insurance and over 21 million of travel insurance policies were provided by the US Travel Insurance Association member companies. In Europe, around 26% of adult population purchased holiday and travel insurance in 2016. Travel insurance combined with 24*7 facilities and covering the entire holiday cost is the most purchased travel insurance policy. However, lack of awareness to the customers about their eligibility to claim and suitable policies hindering the adoption of travel insurance by many users. 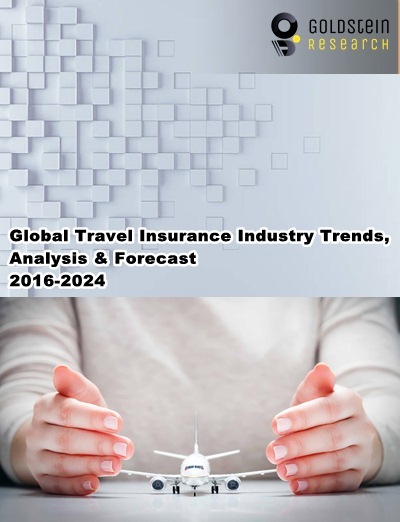 Global travel insurance market valued USD 14.7 billion in 2016 and is estimated to reach USD 26.41 billion by 2024. Global travel insurance market is projected to grow at a CAGR of 7.6% during the forecast period, owing to the increasing tour activities and threats related with terror attacks. Europe is the dominating region for global travel insurance market in 2016, owing to the increasing number of travelers and travel insurance opted in countries such as the UK, Italy, Greece, Russia, Germany, Portugal, Poland and Finland among other countries. Over 70% of European population does not prefer international travelling without travel insurance. The UK is the leading country in terms of adopting travel insurance policies. Moreover, strong expansion of travel industry is supporting the growth of travel insurance market in countries such as Romania and Turkey. Sales of travel policies in Romania and Turkey are expected to grow at compound annual growth rates of 10.1% and 9.2% during the forecast period. Presence of leading companies such as Aviva PLC, the Direct Line Group, AXA and Allianz are also contributing in the dominance of Europe for travel insurance market. Latin America and Middle East & Africa regions are the most lucrative market for travel insurance business in the near future. Declining oil prices improved the travel rates in the region. Increasing travel rate and spending is anticipated to boost the demand for travel insurance in the Middle East & Latin America region. Sluggish growth of disposable income majorly in developing and under-developed countries during the recession period leads to lesser purchasing of travel insurance. However, rising concerns over medical conditions and potential losses allied with airline cancellations and delays are encouraging the consumers to purchase travel insurance policy. Rising number of student travelers for academic purpose and business travelers are contributing in the demand for travel insurance policies among people.